"Using this premise, you would start beginning April First with a topic themed on something with the letter A, then on April second another topic with the letter B as the theme, and so on until you finish on April thirtieth with the theme based on the letter Z. It doesn't even have to be a word--it can be a proper noun, the letter used as a symbol, or the letter itself. The theme of the day is the letter scheduled for that day." 1. It is fun. Really! I had a great time writing my own blog posts, and an even better time reading some of the outstanding writing on the other blogs. 2. It is a creative challenge. Sure, it's easy to come up with a blog using the letter B. It's a different story when you get to the letter Q or X. It was an even bigger challenge for me to keep up with the writing prompts from Write on Edge while participating in the A to Z challenge. Some people write poetry using the letters. Last year, I started my blog post with the letter of the day. This year, I may try something different. 3. Fascinating bloggers are out there! By checking out some of the other participating bloggers, you will get to expand your horizons and find writers from all over the world. Different styles, different vocabularies, etc. The International House of Bloggers, if you will, although IHOB doesn't sound nearly as nifty as IHOP. 4. It is a race with a clear finish line. I don't know about anyone else, but I am not motivated by endless work. It is important for me to know that there is some cheese at the end of my maze! There's only 26 letters in the alphabet, last I checked, and the challenge allows us to have Sundays off. 5. Satisfaction. This isn't the equivalent of running a marathon, of course. When you finish the blog challenge at the end of April, however, there's a sense of satisfaction for a job well done, a river crossed. No running involved! I hope that you will consider joining me April 1st! Why yes, I will consider it! Consider me considering it! There will be plenty to write about next month!!! I must look into this! Sounds great! You've given a convincing argument. I'll link to this in my Sunday Summary. I'm 'almost' sorry I had already signed up for A to Z! I'd love to say this was the argument that convinced me. I like your blog; I like your style. See you next month at A to Z! 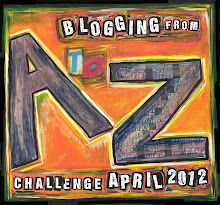 Swinging by from the A-Z Challenge! This is my second year participating - last year I had a blast!! Only 11 days to go now... good luck!